Anyone that is considering adopting a child will likely have a myriad of questions and processes to go through in order to be approved. One major choice that can have a big impact on the entire adoption process is the child’s age at the time of adoption. Adopting a baby is far different than welcoming an older child to the family. While this is a sound statement, the most important aspect that should never change is the goal of raising a kid in need in a loving family, creating a beneficial outcome for all parties. A is 4 Adoption is here as an alternative to your standard adoption agency in California. Our private adoption program aims to deliver comprehensive birth mother help while delivering guidance and support for the prospective parents. After going through this process firsthand, our founder decided to establish an adoption center that strives to streamline the entire process to get more children in need into the arms of waiting families. 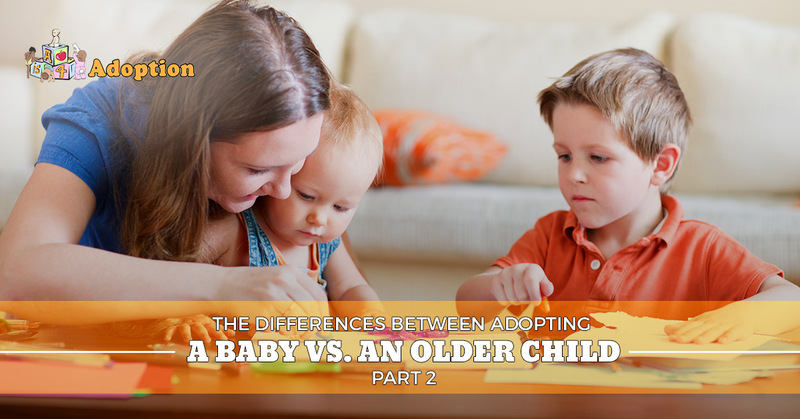 Today, we’ll continue to explain a few of the differences between adopting a baby versus an older child. While our company only provides domestic infant adoption services, our goal is to help all children find a loving family that they can thrive with. When you’re ready to discuss the process, be sure to contact our professionals for help! Infant adoptions are the popular choice for prospective parents looking to grow their family. With a new baby, you are starting with a unique list of challenges and benefits. We’ll look at a few main positives associated with adopting a baby. When you adopt an infant, you’re given the chance to grow up and mature along with the child. Many parents talk of their experiences in learning to parent, where the skill level changes to meet the age and needs of the child. Younger parents who adopt a baby can learn along the way, picking up useful methods and strategies. If you’re in your 20s and adopt a preteen, chances are that you will face unique challenges due to the relative closeness in age and maturity. Adoptive parents will be going through their own maturation process, and adopting a baby gives them the chance to learn and grow in order to become effective role models. A big part of parenting is passing your beliefs and knowledge onto your offspring. Until they’ve reached maturity and can begin to form their own worldviews, they will be looking to you for guidance. Adopting a baby means you will have the opportunity to raise your child with your own values and beliefs. Conversely, adopting an older child can result in you coming to terms with the kid’s own set of beliefs. Oftentimes, adoptive parents will go through the process of rectifying values that they find to be incongruent with their own. This can range from behaviors that are not acceptable in society to ones that simply do not line up with religious beliefs. Adjusting your older child to this new setting can be complex and stressful. Infants will be raised with you from birth, eliminating the concern of needing to re-mold beliefs and behaviors. Oftentimes, people looking to adopt are doing so with the expectation of experiencing the full parenthood experience. Those who cannot conceive or are bound by medical restrictions often receive the most benefit from adopting a baby, as this process is as close as it gets to biological childbirth. From the moment you leave with your new miracle to the day that your adopted child moves out, much of the pains and complications associated with adoption are nullified with infant adoption. Parents will have the freedom to raise their new family addition as they see fit. The young years of a child’s life represent the formative stage on which the rest of their life is built. With an infant, you have the invaluable chance to form a strong, supportive bond right from the start. It’s hard to beat the joy and satisfaction that comes from raising a child from his or her earliest stages. This concept can prove to be beneficial for numerous reasons, many of them having to do with the lack of challenges associated with bonding with a child later in life. No matter what route you choose, the true benefit is that a child in need will be placed into the care of a loving, supportive family. Being able to add a new member to your family can prove to be an amazing experience for everyone involved. Each option provides a plethora of unique benefits and challenges that highly qualified adults can take on for many reasons. It’s important for you and your partner to discuss each option and decide which is ideal for your situation. Taking the time to plan and communicate can prove to be very beneficial, as miscommunications seem to make up a large part of why couples disagree in the first place. Clear communication is a key to success, as one of our previous blogs explained. A is 4 Adoption is your source for the best services available within the private adoption system. Our dedication to helping children, birth mothers, and adoptive parents have created a program that aims to benefit all parties involved. Unlike your standard adoption agency in California, our center strives to cut the red tape associated with the entire process. When we are able to simplify the process while making it more efficient, everyone involved wins. Contact us today to learn more!